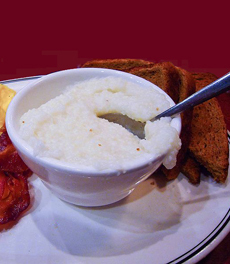 First made by Native Americans, grits are an ubiquitous menu item in the American South. The area from Virginia to Texas is even called the “Grits Belt,” where grits are served for breakfast, lunch and dinner (and that sounds great to us!). Grits are the hard part of the corn kernel (the endosperm), cut into uniform small pieces. They are related to polenta, which is made from a different type of corn and is usually a finer grind. Another related product, farina, known in the U.S. as cream of wheat, is made from semolina flour. For the record, corn is classified by the type of starch in its kernels. Dent corn, the premier corn in the South, has a relatively soft, starchy center that makes the best grits. Flint corn, used for polenta, has a hard, starchy endosperm and produces a more granular cornmeal with a better texture (mouthfeel). Learn all about grits and get the recipe for creamy cheese grits. grits. Photo by Sasha Fatcat | Wikimedia.